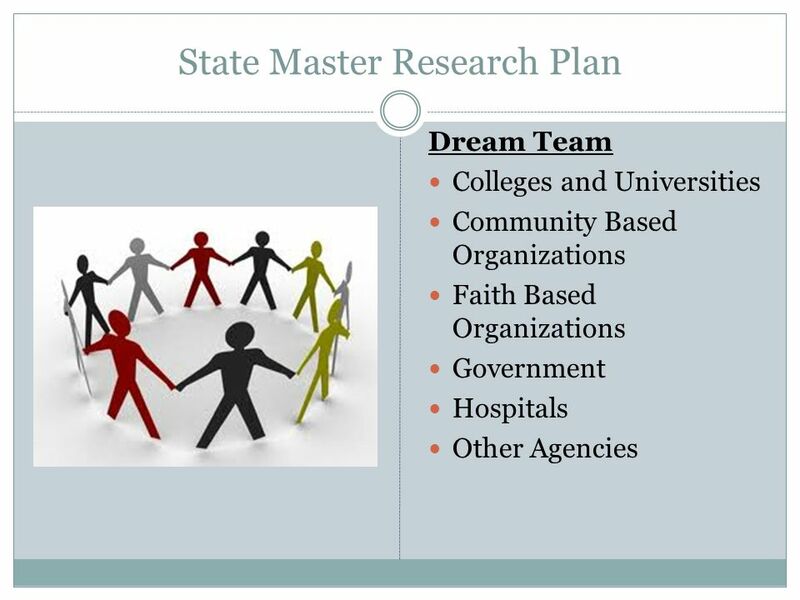 BY CALVIN ROBERSON JR, MPH, MHA VICE PRESIDENT OF PLANNING & PROGRAM DEVELOPMENT State Master Research Plan. 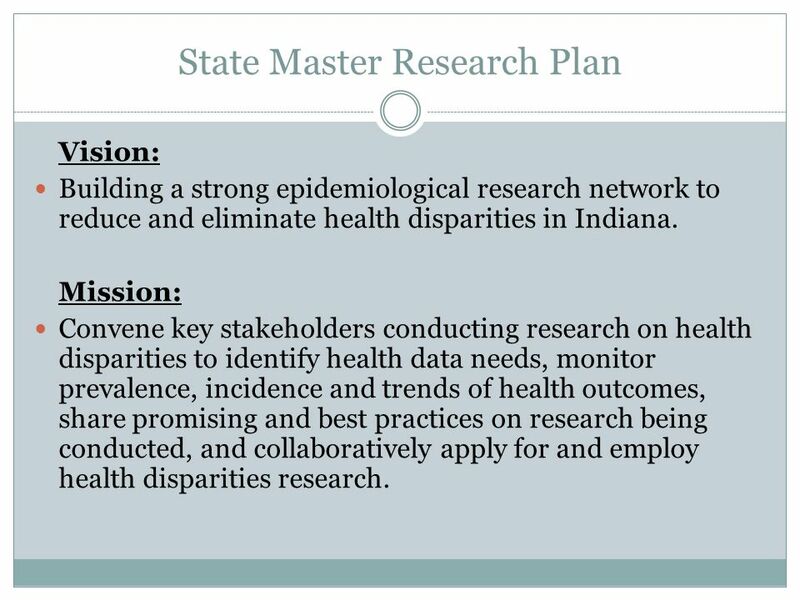 3 State Master Research Plan Vision: Building a strong epidemiological research network to reduce and eliminate health disparities in Indiana. 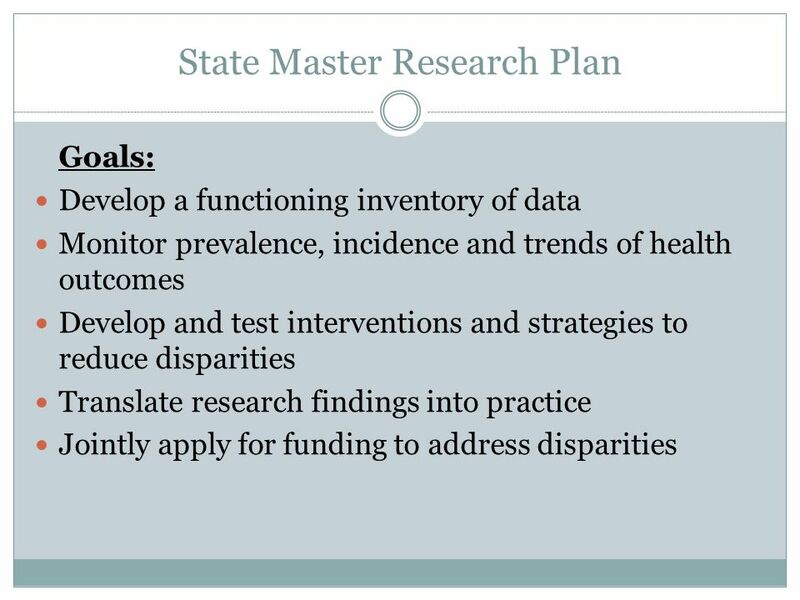 Mission: Convene key stakeholders conducting research on health disparities to identify health data needs, monitor prevalence, incidence and trends of health outcomes, share promising and best practices on research being conducted, and collaboratively apply for and employ health disparities research. 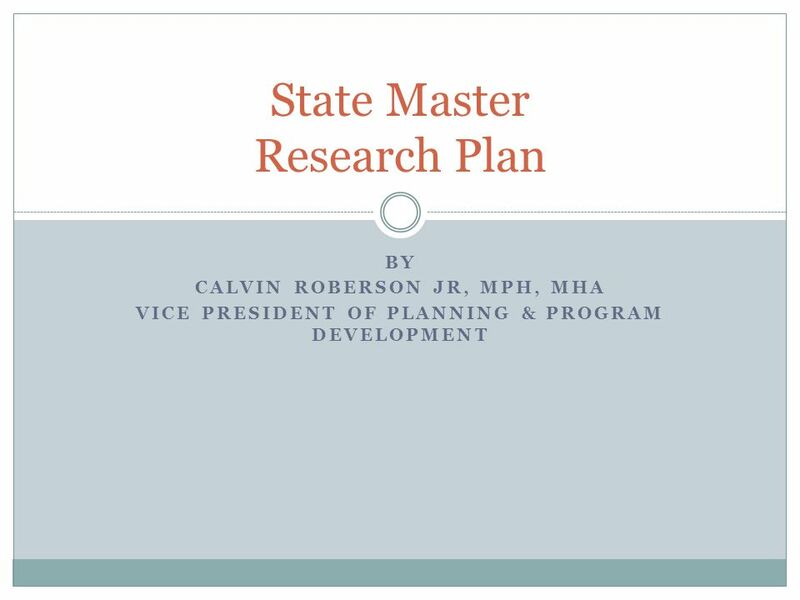 Download ppt "BY CALVIN ROBERSON JR, MPH, MHA VICE PRESIDENT OF PLANNING & PROGRAM DEVELOPMENT State Master Research Plan." April 4, 2012 Indiana Joint National Public Health Week Conference. Family Doctor for All Overview & Research Opportunities Kristin Anderson Director, Primary Health Care Branch Applied Health Research. Key Challenges in the Field of Violence Against Women with Disabilities and Deaf Women Overview Overarching Challenges Barriers to Services Barriers to. What do we do? Assessment Planning Education Outreach Information Intervention Research Convening Respond Collaboration Prevention Needs analysis Facilitation.  1. The changing epidemiology of pediatric practice.  2. The emergence of new technology.  3. The impact of racial and ethnic disparities.  4. The. The North Carolina Hispanic/Latino Lay Health Initiative Barbara Garland August 2006. 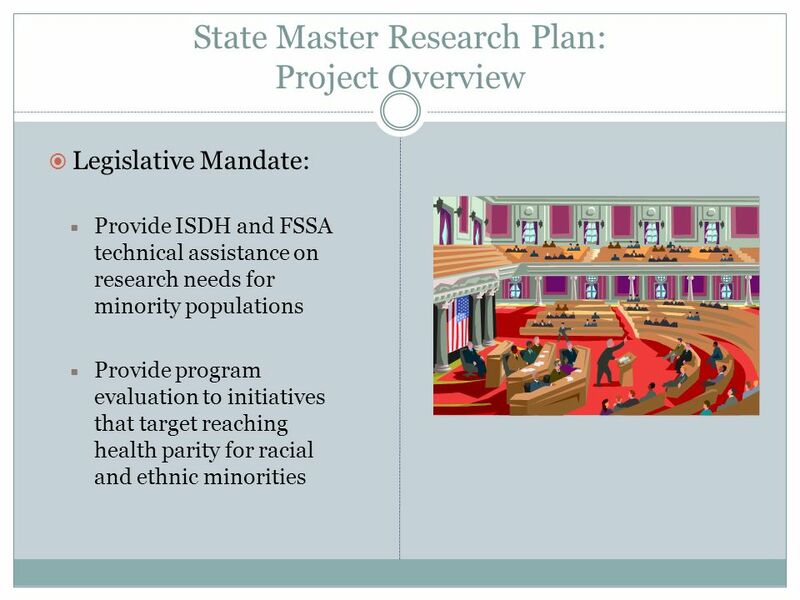 Opportunities for Small Businesses to Address Minority Health and Health Disparities Derrick C. Tabor, PhD, SBIR/STTR Program Official National Institute. CDC Demonstration Project: Dallas County Jail Re-entry Project Klaus Kroyer Madsen Vice President, Programs From the Frontline: Public Health Institutes. An Introduction to Monitoring and Evaluation for National TB Programs. David Brenna, Senior Policy Analyst. 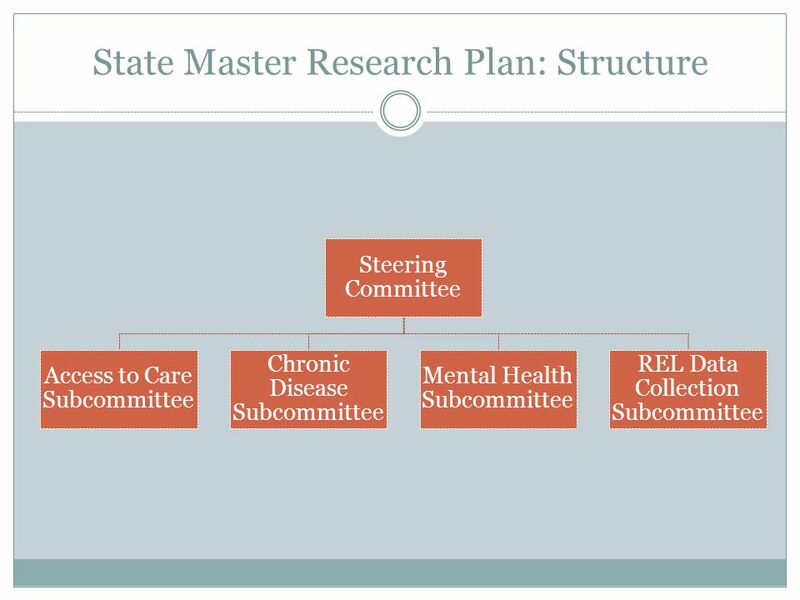 State Comprehensive Plan Goals Goal 1: Americans understand that mental health is essential to overall health Goal. Aligning Efforts— Statewide Commission Pat Simmons, MS, RD, LD Missouri Department of Health and Senior Services. Healthy North Carolina 2020 and EBS/EBI 101 Joanne Rinker MS, RD, CDE, LDN Center for Healthy North Carolina Director of Training and Technical Assistance. Steve Delaronde, MSW, MPH University of Connecticut Health Center The Governor’s Prevention Initiative for Youth July 16, 1999 Identifying Community Resources. Health Care Workforce needs for an industry in transformation Katrina M. Lambrecht, JD, MBA Vice President, Institutional Strategic Initiatives Office. 1 Addressing Racial & Ethnic Disparities in Health Care AHRQ 2007 Annual Conference September 28, 2007.